Jacob Bang’s son, Michael Bang, has worked for Holmegaard since 1968. He developed many of the well-known and successful glass objects for Holmegaard as well as Fyens Glasværk, which later became part of Holmegaard. Michael Bang made e.g. drinks glasses and decorative glass items. He also designed various lamps, including the Epoke series and the lamp Parasol. Another small lamp is Michael Bang’s wall light, Astronaut, from 1970. 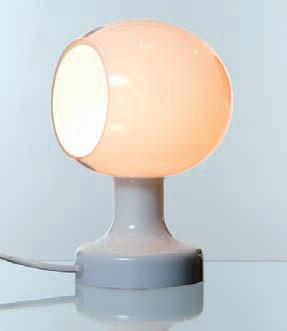 This lamp was produced in opal glass and came in orange and white – though exclusively in one colour, as it is blown in one piece. Michael Bang grew up with glass as his father, Jacob Bang, was artistic director at Holmegaard for many years. Michael Bang has been responsible for a range of Holmegaard’s great successes over the years. As a young man, he started at Bjørn Wiinblad’s workshop and a couple of years later at Royal Copenhagen. Later Michael Bang worked for a glassworks in Sweden and since 1968 has been permanently attached to Holmegaards Glasværk as designer. For the glassworks in Odense, Fyens Glasværk, the young Michael Bang developed the glass series 'Palet'. Palet became glass’ answer to the popular culture of the time with its vibrant colours and became one of the company’s most well-known designs. The Palet series comprised everything from spice jars, vases and bowls to cruet sets, etc. The series was produced in glass overlay, which is double-layer glass with air between, and in fantastic strong colours typical of the 1970s.